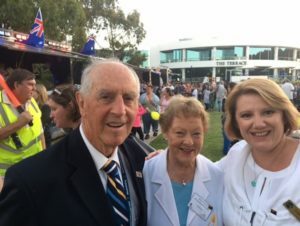 L-R: This year’s Australia Day ambassador and former premier of Victoria, John Cain together with his wife Nancy Cain and Cr Mary Lalios. The Australia Day awards took place on January 26, at the Whittlesea council offices in South Morang Victoria, where four Greek-Australians were nominated for their remarkable contribution to the community. Greek-Australian nominees included: Anastasios Vlahos, for Senior Citizen of the Year for over 53 years of ongoing service to the Greek community. Mr. Vlahos was a volunteer for the Greek Orthodox community and founder of the Whittlesea and Districts Greek Elderly Citizen Club. Nominated for Senior citizen of the Year were Jim Papadimitriou and Spiros Bassiliadis. Mr. Bassiliadis was recognized for his voluntary services at the Panagia Soumella Association of Whittlesea and has assisted with organizing activities for the community. Meanwhile, Elpida Tellis was nominated for Access and Inclusion Citizen of the Year. She has volunteered at the Grace of Mary Aged Hostel in Epping as well as serving as president of the northern suburbs Community of Cypriots women’s group. This year a total of 24 generous individuals were recognized for their contribution to the community, with four finalists selected by the Australian Day Committee.